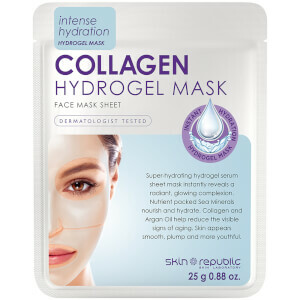 Replenish and smooth skin with the Hyaluronic Acid + Collagen Face Sheet Mask from Skin Republic, an anti-ageing treatment that’s brimming with vitamins and antioxidants to leave your complexion looking visibly younger. 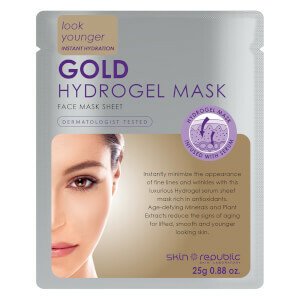 Utilising the Transdermal Delivery System to ensure efficient absorption of beneficial ingredients, the luxurious face mask has been expertly formulated with plant extracts and minerals to help reduce visible signs of ageing. 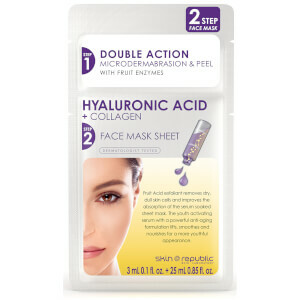 Hyaluronic Acid offers long lasting hydration and helps stimulate natural collagen levels for lifted and revitalised skin. 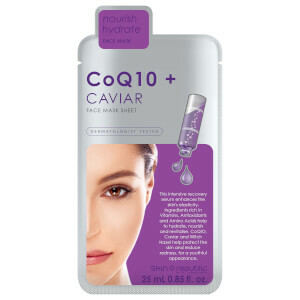 Delivering nutrients and intense moisture with close and continuous contact, the 20 minute treatment minimises the look of fine lines and wrinkles, unveiling a radiant and healthy-looking complexion. Ich finde die Maske super. Meine Haut war danach prall, gut durchfeuchtet und glatt. Für mich ein Nachkaufprodukt.